Bangalore: It is not every day that heads of eight major Indians banks set aside their business rivalry and agree that human resource (HR) policies in Indian banks need to change in order to motivate and retain employees and increase productivity to take on what is a rapidly changing and competitive domestic banking industry. Top officials from six public sector banks: Andhra Bank, State Bank of Hyderabad, Canara Bank, Vijaya Bank, Corporation Bank and Indian Bank, and two private banks: Karur Vysya Bank Ltd and South Indian Bank Ltd, discussed the issue on Friday at “The Mint South Banking Conclave" in Bangalore. 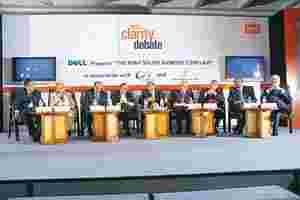 The discussion, moderated by Mint’s Mumbai bureau chief Tamal Bandyopadhyay, was the first of Mint’s invitation-only Clarity Through Debate events. The Indian banking industry, which employs about 750,000, needs 500,000 more employees over the next five years, according to industry estimates. About 63,000 bank employees will retire in the next three years, according to an Indian Banks’ Association data. “Meeting the intellectual requirements of an employee is a challenge. We are providing 40-50 e-learning courses to hone the skills of our staff. People are being trained to use computers. If banks are able to create an environment of job satisfaction, they can retain people," said M.S. Sundara Rajan, chairman and managing director of Indian Bank. Bankable voices: (from left) M.S. Sundara Rajan, CMD, Indian Bank; P.T. Kuppuswamy, chairman and CEO, Karur Vysya Bank; B. Sambamurthy, CMD, Corporation Bank; Prakash P. Mallya, CMD, Vijaya Bank; Tamal Bandyopadhyay, Mumbai bureau chief, Mint; M.B.N. Rao, CMD, Canara Bank; Amitabha Guha, MD, State Bank of Hyderabad; V.A. Joseph, chairman and CEO, South Indian Bank; and K. Ramakrishnan, CMD, Andhra Bank, at The Mint South Banking Conclave in Bangalore on Friday. “How many of us will go to a young surgeon or a young mid-wife? The general perception is that aged (experienced) is better," said M.B.N Rao, CMD, Canara Bank. Andhra Bank’s CMD K. Ramakrishnan said it is wrong to assume that higher age means lesser efficiency. Banks need to familiarize their employees with changing industry trends and technologies, he said. The upside of an aging workforce is that higher pay package alone cannot attract them into job-hopping, added Amitabha Guha, managing director, State Bank of Hyderabad. Higher pay packages from private banks, with target-based incentives, perks and other facilities, often attract employees from public sector banks. “I agree that people need to be paid in line with industry remunerations. However, accelerated promotions, training, incentives, profile enrichment, openness to new ideas and attitudinal changes within the organization can help in retaining talent," said Rao. The bank chieftains say that pride in their work and social recognition does motivate their employees. However, higher wages being paid elsewhere for the same work does bother some. “The respect and recognition that we get in the society is an award in itself. However, salaries hurt when compared with the private banks," said Prakash P. Mallya, chairman and managing director, Vijaya Bank. Nationalized banks say their reach into far-flung rural areas would not have been as intense without the government’s initiatives. While they do not want the government to pull out entirely, they would like to have HR policies out of the governing body’s purview. “The board and the chairman deserve more freedom. They know the ground realities and expectations of their employees better," said P.T. Kuppuswamy, chairman, Karur Vysya Bank. Gauging ways of cutting down attrition, motivating employees and sensitizing them about the changing dynamism in banking are not new with bankers. State Bank of India (SBI) has initiated parivartan, a mass communication programme, for its staff. The idea is to bring cultural changes among its employees and energize them through incentives, training and motivation, according to SBI chief O.P. Bhat.